Ricky Carmichael’s Motorcross Matchup Pro is an iOS game that is currently available for download on the iPhone, iPad and iPod touch for free. The app was developed by 2XL Games and is currently on the best racing applications on the market today. Ricky Carmichael’s Motorcross Matchup Pro allows you to race against other people from all over the country. Thre are 10 tracks total both indoor and outdoor. Every race will give money to the winner which can be used to unlock upgrades to your bike. There are a wide variety of tracks to choose from, and a recent update of the application has added even more tracks. If you become good enough, you can even win real life prizes. Anyone that loves racing or motorcross will have to download Ricky Carmichael’s Motorcross Matchup Pro and test their skills. Without good controls, then RCMM Pro would not have be successful. Nobody wants to be racing against their friend and lose because the controls screwed them up. Luckily, this will never happen because the controls are very tight and responsive. If you want to get fancy, stunts can even be performed during the races. The audio is another strong feature of Ricky Carmichael’s Motorcross Matchup Pro. The bikes sound authentic except for the volume level. There is no commentary, but that is to be expected for a free iPhone app. The commentary would have added to the experience, but nothing is taken away from the experience without it. The best feature of Ricky Carmichael’s Motorcross Matchup Pro is easily its graphics laid out over its wide selection of courses and riders. This is one the best looking games available on the iPhone and iPad market. 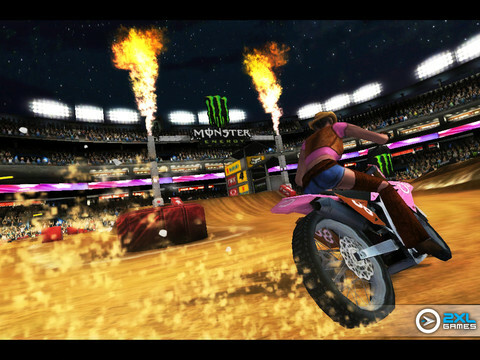 If you connect your device to your television, then you can even play Ricky Carmichael’s Motorcross Matchup Pro on your television. This allows the graphics to shine through even more. You would think that the graphics of a downloaded game on a smart phone would suffer on a large screen, but this is not the case. While the graphics will not compete with the graphics found on the Xbox 360 or PS3, they will look similar to the previous generation of those gaming machines. The recent update that added more tracks also slightly enhance the graphics, so Ricky Carmichael’s Motorcross Matchup Pro looks better than it has ever looked before. Ricky Carmichael’s Motorcross Matchup Pro dose look slightly better when playing on the iPad than it does on the iPhone or iPod touch, but the difference are not very noticeable. 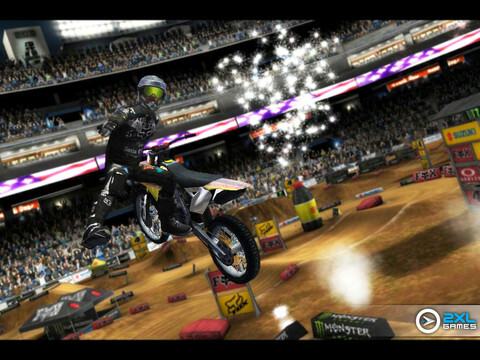 Ricky Carmichael’s Motorcross Matchup Pro is easily one of the best games that you can download on your smart phone. When you add that the application is free, then you are getting an extreme value. There are in-app purchases for packs of Gold Wrenches for those who want to have a bit more fun. These cost anywhere from $0.99 to $19.99 per pack. The game also has a built in achievement system and leaderboards. If you love great games, then you must download this one. Ricky Carmichael’s Motorcross Matchup Pro easily gets a score of 5 out of 5 stars. AppSafari review of Ricky Carmichael’s Motocross Matchup Pro was written by Darius Reimm on September 23rd, 2011 and categorized under App Store, Featured, Free, Fun, Games, iPad apps, Racing, Universal. Page viewed 6673 times, 1 so far today. Need help on using these apps? Please read the Help Page. This game is full of bugs..!! very frustrating!